Yet another superb story about the Man from U.N.D.E.A.D. It is difficult to say anything about this story which does not involve spoilers of some kind but the trips to both ISS and the past were amusingly ridiculous! This has to be the best book in the Man From U.N.D.E.A.D. series (so far!). It would work as a stand alone book but to fully appreciate the story I recommend that you read the previous books (they are worth reading on their own merit anyway). From brain draining spiders to party poppers in space, including a Dummies Guide to Time Travel, Darren Humphries takes you on a whirlwind of an adventure as he tries to rescue his girlfriend from the clutches of a very confused bodycruncher. Once again it is up to Agent Ward to save the day, only this time he isn't playing by the rules, literally and even more so than usual! The writing is excellent and like all the previous books is of a very high standard, not only that but he even manages to throw a few jokes in to give those tense moments a bit of a lift. For the first time in this series even my heart was touched, a small tear may have appeared in my eye (it was a bit of dust, honest!) I don't believe this is the end of Agent Ward though, he doesn't give up that easily.This book is so much more than just one genre (it's possibly a little bit of everything all thrown together) and I recommend it to anyone who loves a good read. Agent Ward excels himself in this latest adventure. He not only leaves the planet’s surface, but goes back in time, and all for the love of a lady. He meets some strange creatures this time; Braindrain Spider Demons, Bodycrunchers and Howler Demons are but a few of his adversaries in this action packed adventure. Once again, the writing is full of wry humour and some silly sideswipes at things we all know and love – the acronym TADRIS, for example. The book is at once a light-hearted romp and a quest for the answer to ‘How far would you go to save a loved one?’ There’s a bomb-shell ending too.Darren Humphries excels at word-play, irony and even occasional belly-laughs. Agent Ward, whatever the circumstances, can hardly help his sarcastic tongue getting him into trouble. 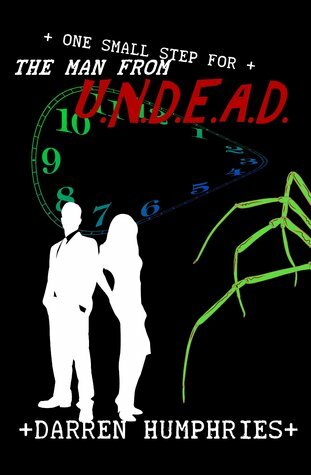 These ‘UNDEAD’ stories are heavy on the fantasy and science fiction but very easy on the eye. I really enjoyed this! This is a continuation from the previous 3 in the series - it seemed to have run out steam a little and was shorter. I was not as impressed and would have liked more story to it.I thought that this book was not quite as imaginative and complex in the story-line as the previous ones in the series. It started well with the spider demons n the Senator but the book then seemed short and less well developed. Still will probably read the next full length story when it comes out - prefer to do this as I tend to find short stories rather unsatisfactory reads. Another fantastic book in the Man from U.N.D.E.A.D. series. Agent Ward once again finds himself in a whole manner of scrapes, trying to save the world from a gender-confused demon. This time he travels through time and space and across the planet, trying to save mankind.Once again, Agent Ward is a witty, slightly less suave than Bond, character who is likeable and his friends who support him and surround him are equally so. I can't wait to see what the next instalment will bring. Once again it's up to Agent Ward to save the world. A pretty thankless task when all is said and done. I'm not going to give the game away, only going to say that this series just keeps getting better. Well done Mr Humphries, along with Charles Stross, you are keeping the fine tradition of Deighton and Fleming alive and well. The fourth instalment in the Agent Ward saga is the best so far. Darren Humphries has truly hit his stride with this series and I do hope it continues over many more books.If you love adventure and laughter, you'll love this series! Darren Humphries - I am English and recently bade a fond farewell to my forties. I have been writing stories since school when I won a parker pen for being shortlisted in a national schools writing competition.My particular genre of choice wanders around all over the place, but has mainly settled into humorous fantasy and science fiction (or at least I think they're humorous and some people who have kindly left reviews seem to agree).During any spare time (of which there isn't much since I'm recently widowed and dealing with two children) I edit a website focussed on science fiction television at scififreaksite and a similar blog on the side.I then try to cram in a few books on my kindle to read.